Our Guide will pick you up from the airport or your hotel and bring you to the Infiniti, where after a brief welcome and safety briefing, you will be assigned cabins. The cruise director will have a full dive schedule ready for you. 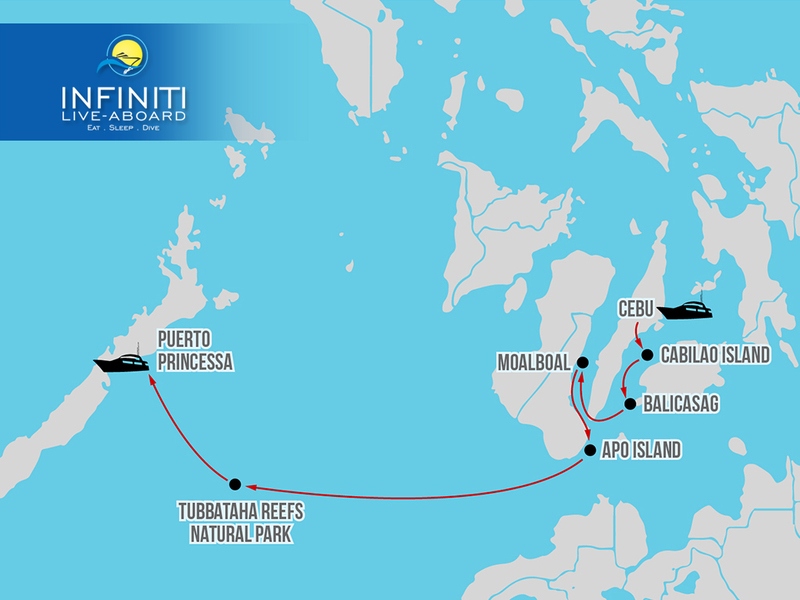 This being our transition trip, we will explore the Visayas and Bohol region and then travel to Unesco World Heritage Site, Tubbataha Reefs Natural Park before disembarking in Puerto Princessa. Cabilao Island, Bohol: Encounter Barracudas, dogtooth tunas, giant trevallies. Also enjoy stumbling on macro marine life like sea horses and nudis. Balicasag: A marine sanctuary in Bohol, you will definitely remember exploring its famous dive sites where beautiful corals are teeming with reef life and whale sharks! Moalboal: From there we go explore Moalboal on the west coast of Cebu. Well known for its shimmering shoals of sardines, sea snakes and sweet lips. Apo Island: Cruising to Apo Island, we explore its reef walls, covered with corals, where we can see sea turtles, angel fish, snapper, barracudas, moray eels, triggerfish, and white tips. Diving Tubbataha Reefs Natural Park, a UNESCO World Heritage Site, is on almost every divers bucket list and rightfully so. The dive sites visited on this trip include and are not limited to the Malayan wreck, Wall Street, Amos rock, shark Airport, Washing Machine and the ranger station on the North Atoll. 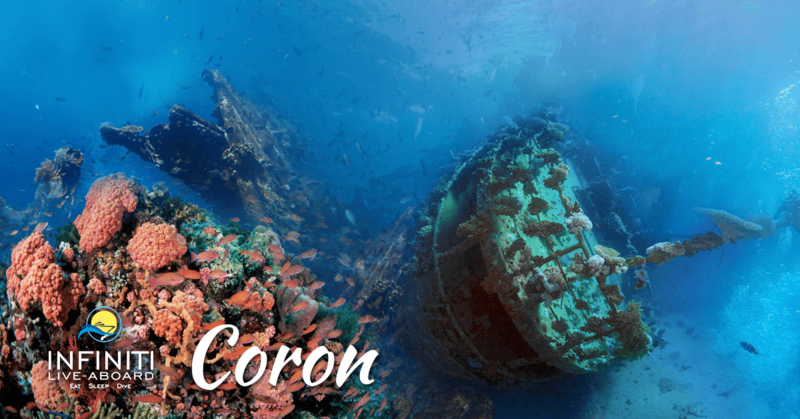 On the South Atoll, we will visit South West Wall, Staghorn Point, Delsan Wreck, Black Wreck and T wreck. From there we go dive the famous Jessie Beazley Reef located northwest of the North Atoll, before disembarking in Puerto Princessa. Marine Life: Nurse sharks, white tip, black tip, and grey reef sharks can be seen patrolling these waters in large numbers. Manta rays eagle rays can be seen closer to the surface along with endangered green turtles and hawksbill turtles. Giant trevallies, red snappers, groupers, barracudas and Spanish mackerel and other large fish are also seen in the reefs of Tubbataha. Pygmy horses, small reef fish and anemone fish often hide in the giant gorgonian fan corals and other hard and soft corals.